Batman Arkham Asylum was a great game, sure, but it was lacking co-op. It wasn't exactly the most kid-friendly title, either. The next Batman game will be on the opposite end of the Dark Knight spectrum, adding in 2 player co-op and tying in to Cartoon Network's Batman The Brave and the Bold show. The show itself is incredible, featuring a square-jawed, Silver Age art style along with dozens of guest appearances by other DC heroes. 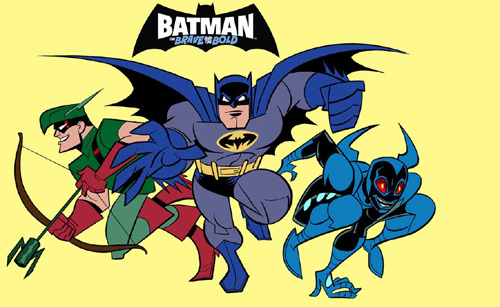 Batman The Brave and the Bold will be available on Wii and DS. Linking the two games together will unlock Bat-mite (sweet!) as a playable character. WayForward, the developers, worked on Contra 4, so they know co-op. I think the series is a good fit for a co-op game, since it's a different team up every week, and can't wait to get my hands on it. I'm sure my kid will love it, too. We'll keep you posted as we hear more! Batman: The Brave and the Bold Wii + DS = 3 Player Co-Op?